Nigeria’s Minister of Information, Lai Mohammed has said that the Presidential candidate of the Peoples Democratic Party, PDP, Atiku Abubakar will be questioned upon his return from the US. 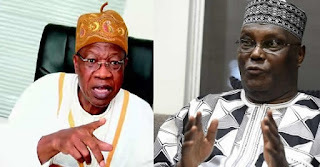 Lai Mohammed stated that a paper trail shows that he benefitted from N156 million. Mohammed says that the Nigerian government has proof of the account mandate, cheque and account statement showing Mr Abubakar as the signatory to the account that received the money. “We want him to stay in the US for as long as he wants but he has to explain to Nigerians when he returns,”.